Every day You are turning out bricks. The building blocks of your life. Sure, some days and some bricks are better than others, but they are coming out one after the other. The question becomes, what are you building with them? Are you building with intention? If you are not, you are not alone. But is that what you had in mind? A planner builds with intention. It may take years to build, but even with setbacks, if the planner's intention is unwavering, the majestic building gets built. It's too easy to end up with a dog house. It's so much easier to work with tools that delight. I look at some of the staid old interfaces of applications that haven't gotten a meaningful update in years and I find myself wanting to use them less and less. The tool isn't getting worse. The rest of the world, the other agents, apps and devices competing for my attention are becoming more engaging. They do it so that I will pay more attention to them. They are fighting for a scare resource -- the diminishing supply of seconds in my life. It may come a time when a tool is no longer the right one for me. for you. It may be time to move on. It is ok. Just move. We're working on something new. Really. If you think you want to do something, then get started on it. There is no point in waiting for permission... no one is authorized to grant it. There is no point in waiting for perfection... you may never get there -- and for the lack of perfection, your flame may never shine. There is no point in waiting for the timing to be right... there is always an excuse, but it's never as good as you at your best. You want to do a thing? Do it. Don't wait for it to be authorized. That will come later. Don't wait for it to be perfect. You can fix it as you go. Don't wait for the right time. The right time is almost always right now. This is the future of gaming. I think I'm in. Ok... I think we are all in. ps: I didn't edit the audio or put a wrapper on it. It's just the way Loyd Ford presented it on his website. There are days you feel like the Universe's whipping boy. Everyone and everything is taking a whack at you. The car breaks down, a filling falls out, a paying customer goes out of business. Things happen. It feels bad.... It's ok to feel bad.... It would be crazy and possibly delusional not to feel the pain of the disappointment. But if you love what you do... then you know you'll be alright. Actually, if you love what you do and you are not afraid to do the work, then you can't be beat. even if it hurts. even if it doesn't work just right. You'll keep at it -- because it's the work you love. Is the Productivity Pack a good deal? UPDATE (2015-2-6) : Now a three month Dropbox Pro subscription has been added to the deal. (You get it even if you have already paid.) This makes the deal even sweeter -- if you are into good deals. I have used all four services at various points in my software evaluations. At this point I pay for Evernote Premium, which is $45 per year and LastPass Premium at $12 a year. 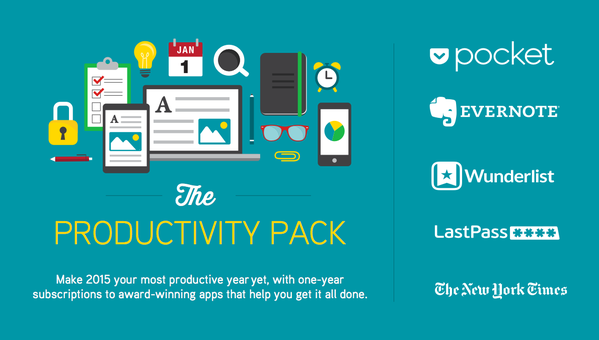 If you aren't using these apps, then maybe you should be giving the free versions a whirl. If you're quick to make decisions on these things then you can get that first year at a discount.